Rev. 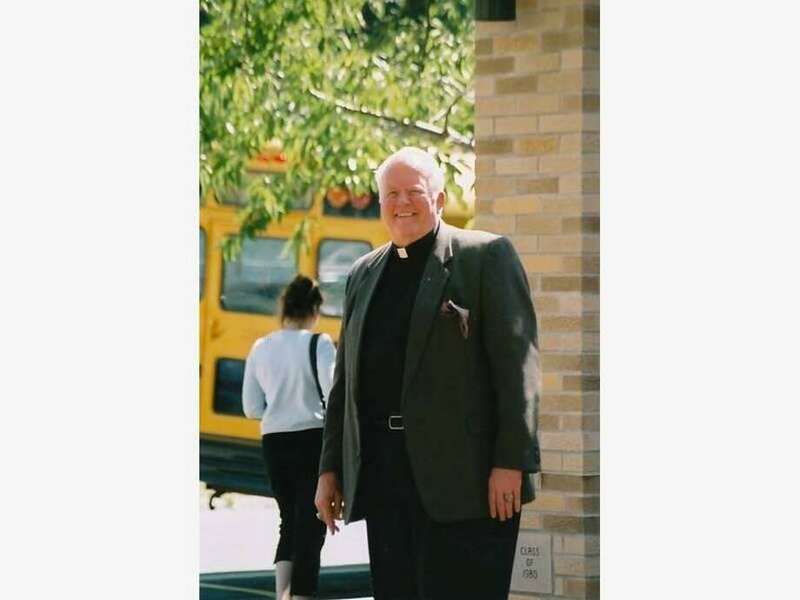 William Sangiovanni — known as “Father Bill” to generations of students at Notre Dame High School in Fairfield — died Monday morning after being in declining health for several years. Born in Brooklyn, Sangiovanni came to the Bridgeport diocese when he enrolled at Fairfield University, where he graduated in 1962 with a degree in history. He earned a master's from Fairfield University in education and arts. He went on to teach at Fairfield’s Assumption School. Then, from there, he went to Our Lady of Angels Seminary at Niagara University in New York. After four years or religious training, in 1969, he decided to leave. Instead, Sangiovanni served as special assistant to the Minority Leader of the Connecticut General Assembly, and as assistant to U.S. Congressman Steward McKinney from 1969 to 1975. Sangiovanni went to Hartford as a research assistant to Stewart McKinney in 1969. At the time, McKinney was the Minority Leader of the Connecticut House of Representatives. The following year, McKinney was elected to Congress and Sangiovanni became the district representative, running the Bridgeport and Fairfield offices. Sangiovanni continued to support McKinney through a difficult re-election in 1974. But shortly after, he left McKinney’s staff. People in Fairfield started to call for Sangiovanni to run as a bipartisan candidate for the town’s position of First Selectman, but he turned them down. In the spring of 1975, he became a deacon and left Fairfield for Kentucky. He soon became a full-time teacher and assistant chaplain in the Frenchburg State Prison. When he came back to Connecticut, he requested an assignment counseling prisoners at the Bridgeport Correctional Center. Beginning in 1980, Sangiovanni was a faculty member, chaplain, department chair, assistant principal, principal and president of the Fairfield school on Jefferson street. “It is with heavy hearts that we make this post. The Notre Dame community is mourning the loss of Rev. William ‘Father Bill' Sangiovanni, who passed away this morning,” Notre Dame principal Christopher Cipriano announced Monday on the school’s Facebook page. “Father Bill’s passing is a tremendous loss to all of us who knew him so well,” Cipriano said. For several years during his time as school principal in the mid-90s, Sangiovanni coordinated a GarlicFest under a big tent adjacent to the school. A major fundraiser for the school, the event attracted thousands of garlic lovers and vendors from throughout the area. On the occasion of Notre Dame’s 60th anniversary Gala celebration in March 2017, the Diocese of Bridgeport mentioned Sangiovanni’s then 37 years with Notre Dame and his massive impact on the school. Sangiovanni was ordained in St. Patrick Church in Bridgeport on March 19, 1977. After serving first as parochial vicar at St. Patrick's, he was named to the faculty of Notre Dame in 1980 and became the school's spiritual director the following year. In 1991, he was appointed to the State of Connecticut's Ethics Commission, and later became vice chair. Father Sangiovanni also served as a part-time chaplain at the Bridgeport Correctional Center for 11 years. Father Sangiovanni was named president of Notre Dame in 2010.